New Braunfels Smokehouse is a smokehouse and restaurant located in New Braunfels, TX. The company's history goes back to 1943, when it originally opened as a ice factory. Local ranchers used to bring their meats to them for cold storage. A smokehouse employee, who came from Germany, got the idea of smoking some of the meats using an old German recipe. Locals in the area loved the smoked meats, and soon orders started coming in from all over Texas, and the ice factory shifted gears and became a smokehouse. 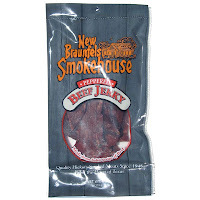 Like most smokehouses, jerky is a popular product, and New Braunfels Smokehouse offers several varieties of beef jerky, turkey jerky and pork jerky. I'll be reviewing six of their varieties over the next couple of months. Beef, water, salt, sugar, sodium nitrite. The first thing I taste from the surface of these pieces is a salty, smoky flavor, with a slight meaty aroma. There's a faint bit of sweet on the surface also. Several seconds of sucking on a piece, and I can barely sense the black pepper. The chewing flavor starts with a well-noticed meat flavor, a stronger smokiness, and a stronger saltiness. I can pick up a bit more black pepper. For being dubbed a "Peppered" variety, there certainly is a black pepper flavor to this, but quite light. The pepper is perhaps noticed more with the eyes than with the tongue. In my opinion, this is better described as simply the company's original variety, than specifically a peppered variety. Otherwise, the bulk of this jerky's flavor seems to come from an even split between the natural meat flavors and the saltiness. The natural meat flavors have a moderate level of smokiness. The saltiness comes from within the meat. When you combine the meat flavors, the smokiness and saltiness, it gives me a flavor reminiscent of smoked sausage. The salt intensity level seems somewhere between moderate and high. Interestingly, the nutrition facts labels shows a very low 190mg per 30g serving, which ranks as one of the lowest sodium content beef jerky brands I've encountered to date. But it's strange that the salt intensity tastes much higher than it actually is. 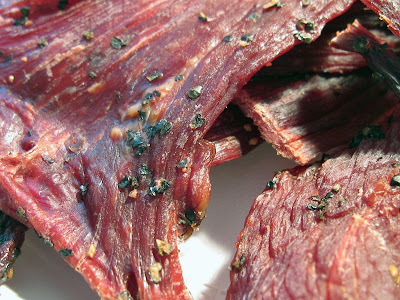 Overall, what you're going to notice in this jerky the most is a salty, smoky, natural meat flavor. There's just a touch of black pepper flavor. These are slices of whole meat, sliced thin to medium thickness, and in medium-sized pieces. 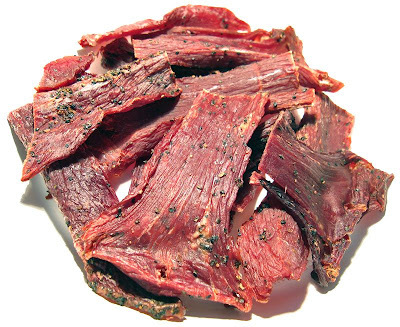 This is a dry jerky, with some pieces having a soft, pliable feel, and others having a more hard, dry feel. Tearing pieces apart with my fingers seems moderately easy, while chewing is varies between moderately easy to somewhat tough. For the most part, chewing requires some amount of effort. The chewing texture starts out with a fair amount of rubbery chewing resistance. With some sucking and light biting it seems to chew down to a soft mass in about 15 seconds. At that point, it has a very steak-like chewing texture, fibrous, somewhat dry, more like a steak cooked well-done. The pieces seem very lean, I found only one piece with a visible chunk of fat. I found no tendon and no gristle, and no stringy sinews. This jerky is also very clean eating, no residue picking up on my fingers, and tiny fragments flying off as I tear pieces apart. New Braunfels Smokehouse sells this Peppered variety from its website at a price of $9.50 for a 4oz package. However, I purchased this through their "Jerky Sampler" which gets me six 4oz packages, each a different variety, at a price of $43.95. Add to that shipping costs of $12.95, and it comes to a total of $56.90. That's a per ounce price of $2.37. For general jerky snacking purposes, at the $2.37 price per ounce, it seems to offer a decent value. I'm getting quite a bit of snackability out of this, mostly for a very good flavor, a good chewing texture, and a good meat consistency. While the $2.37 price per ounce is considerably higher than store-bought mass-market jerky, it's clearly a higher quality jerky that provides a lot of snackability. As a Peppered jerky, at the same $2.37 price per ounce, it's a weak value. I only get a light amount of black pepper flavor, in some pieces hardly any. If you're specifically wanting that black pepper flavor, you'll get more from Jack Link's Peppered jerky. I'm actually quite impressed with this jerky and found myself straddling the line between "good" and "best". For a jerky with a simple set of ingredients, it gave me a decent amount of natural meat flavors, with a well-noticed smokiness. It's rather salty, with just a touch of black pepper, but I found myself liking the flavor of this stuff. However, it's also marketed as a "Peppered" jerky and I just don't get enough of that flavor say that this jerky stands up to that claim. If I were to pay $9.50 a bag to get something advertised as "Peppered", I expect to get a good deal of that flavor. Otherwise, from my perspective, snackability is compromised when I don't get the flavor I had hoped to get. I think the saltiness is rather high, even though the sodium content shows the opposite, being very low. But I think high saltiness may be masking much of black pepper flavor. It has a pretty good chewing texture and meat consistency, a little more dry, and rather chewy, but overall still pretty good as far as jerky goes. 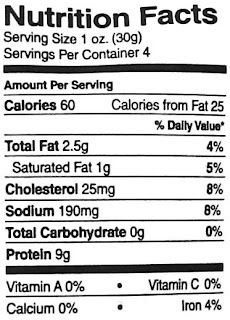 This would make an excellent dieting jerky, being a very low calorie jerky, with zero carbs, and a scant 190mg of sodium per serving. For my beer recommendation, I'd go with a lighter tasting brew, like a blonde ale, or kolsch.